AUSTRALIAN ROD AND CUSTOM COMPONENTS. HOT ROD OR CUSTOM CAR. Wiring kits use GXL 125 high temp cross linked polyethylene jacketed wire. That is grease, oil, gas, and acid resistant. Every 300MM its entire length so checking a circuit is. So you know exactly where it goes -. The kit comes with two different style column plugs and wired head light plugs. The mountable fuse box has all fuses plus flasher units built in, and a external horn relay closely joined. THE WIRING KIT INCLUDES THE FOLLOWING. 1 PREWIRED FUSE PANEL WITH 17 FUSES AND 1 BREAKER. 2 SIGNAL FLASHERS AND 1 PREWIRED RELAY CONNECTOR WITH HORN RELAY. 1 PRE-WIRED LATE GM ALTERNATOR PLUG. 2 PRE-WIRED GM COLUMN IGNITION SWITCH PLUGS (can be changed). 1 PRE-WIRED DIMMER SWITCH PLUG. 2 GM TURN-SIGNAL CONNECTORS FOR THE PRE-TERMINATED WIRES (3 7/8" AND 4 1/4"). 1 FUSIBLE LINK (3 BLACK WIRE WITH RING TERMINAL). 1 LARGE GROMMET - FOR RUNNING WIRE'S THROUGH FIREWALL ETC. 20 INSULATED TERMINALS AND CONNECTORS + SMALL CABLE TIES. 2 LOOSE WIRES (NEUTRAL SAFETY SWITCH WIRE AND PANEL LIGHT WIRE). 1 INSTRUCTION BOOKLET WITH DIAGRAMS FOR GM, FORD AND MOPAR. WITCHES ALSO AVAILABLE- head light, key ignition, wiper, hi-beam dipper. TO SEE FULL RANGE OF PRODUCTS IN STORE. 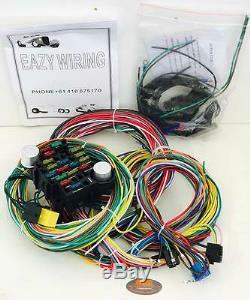 The item "21 CIRCUIT UNIVERSAL WIRING HARNESS / LOOM EAZY WIRING SUIT HOT ROD, RAT ROD" is in sale since Tuesday, February 2, 2016. This item is in the category "Vehicle Parts & Accessories\Car & Truck Parts\Charging, Starting Systems\Other". The seller is "ahcomponents" and is located in Mudgeeraba, Queensland. This item can be shipped worldwide.